RapReviews.com Feature for August 19, 2014 - LMNO's "Preparanoia"
The phrase "long time emcee" starts to feel trite when you've written it a hundred times, but that doesn't make it any less true for California rapper LMNO, who can date his career back to the mid-1990's thanks to his membership in The Visionaries. Even if you don't know the group as a whole (their last release together was a 2007 mixtape) they've been prolific when working on their own projects - 2Mex has half a dozen albums, DJ Rhettmatic has almost as many, and LMNO has more than both plus the other group's members put together. Even if we did one LMNO album per week that hasn't already been covered on the site every week for the rest of the year, I don't think we could get to them all before 2014 ends - and he'd likely drop a new album in the interim. 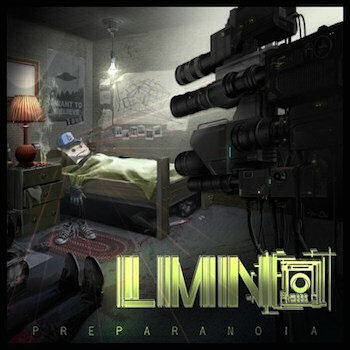 The title "Preparanoia" seems fitting as a portmanteau given LMNO's extensive discography. It would be easy to surmise LMNO is both "paranoid" about his rap future and "prepared" for his demise untimely or otherwise. The reason that 2Pac recorded enough albums for years of posthumous releases was a clear case of "Preparanoia." For a moment I thought I was paranoid myself until I realized the first single "The Most" was actually the last track on LMNO's new album - I thought he had deleted it before this week's release. It comes across as a political protest: "People with the most power/tend to not know how to use it." Et tu Ferguson police force? "There's more of us than their ammunition/it'll run out, eventually, blood will spill." Out of context those lines are even more potent but they certainly work well enough over Samplecentric's subtle backdrop. It gives the precise and measured flow of LMNO all the room it needs to breathe. Actually if LMNO was going to be paranoid about anything it would be the divisive opinion over his vocals. I imagine the same people who are against it are also not fans of Evidence, though his California flow is slower and deeper. Nevertheless there are times when LMNO borders on being anti-emcee. There's no consensus amongst our staff - Jay Soul has called him a "terrible/deluded" emcee while Grant Jones says a good LMNO album "relies on his monotone" to succeed. Who's right? After a thorough examination of "Preparanoia" I'd have to say that they each have a slice of the truth, though I think Grant took a bigger cut of the pie. If LMNO wasn't constructing interesting bars on tracks like "Last Long" and "Now" I'd get my fill of his delivery, but he's a visual rhymer who vows he's "eccentric with the samples/trampling the pads on the MP like a untamed animal." That also suggests at least some of the album is self-produced, but I didn't receive full liner notes to determine which ones are or aren't. There's equal parts beauty and brutality though - "Apricot" featuring Mr. Brady has a sinister buzz, "Thumbs Up" is a mellow backdrop for thoughtful self-exploration, and "Who?" has the kind of heavy drums that suit L perfectly to rap on. America the beautiful, America the rude! So I'ma drink the cyanide cause it's cheaper to die"
LMNO is a serious emcee for serious times, and his cult following has certainly enabled him to be prolific, even though it hasn't garnered him the commercial recognition he or his Visionary peers might have hoped for. If there's one thing you can pigeonhole him for it's that his style will draw a selective audience that probably isn't into Future OR Odd Future. He's not going to sing his way to success, and he's not going to shock the world into paying attention to his words - he'll keep on calmly spitting his thoughts over beats. There's more charisma to his rhymes than some will give him credit for (think Keith Elam) but there are also times where he needs to say "beats don't fail me now" and they leave him hanging. It's a mixed bag but on "Preparanoia" it's mostly a success.